Highway transportation accidents are a major cause of job-related fatalities —and workers age of 65 and older may be at the greatest risk of dying in transportation accidents. The Centers for Disease Control and Prevention found a fatality rate of 3.1 per 100,000 full-time workers over 65. The fatality rate for those ages 55-64 was 1.4 per 100,000 full-time workers. The CDC analyzed data from the Census of Fatal Occupational Injuries between 2003 and 2010. The researchers compared highway transportation fatalities involving workers ages 55- 64 and 65 and older with the fatality rates for workers ages 18-54. During the years studied, 11,587 workers above the age of 18 died in highway transportation workplace accidents. Out of these, 3113 or 27% were older than 55. 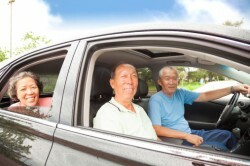 Workers above the age of 65 who had an American Indian or Alaska native backgrounds had a fatality rate that was more than four times higher than those ages 18- 54. Among Hispanic workers who were 65 and older, the fatality rate was more than twice the rate for those 18-54. In the case of non-Hispanic workers, the fatality rate for older workers was more than three times that for younger workers.